Download this valueable case study for manufacturers at no cost or obligation. Learn how other businesses in the manufacturing industry are making smart buying decisions and saving money! 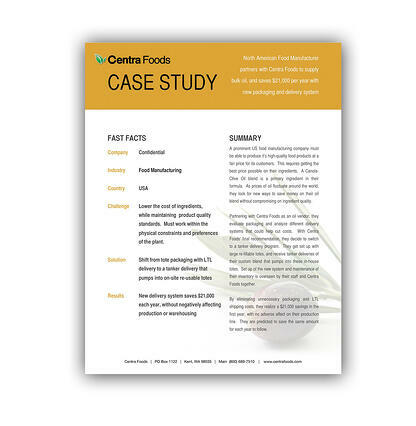 Review this detailed case study about a large US manufacturer that put a new purchasing system into place by changing how his olive oil was delivered, while still keeping his in-house storage and packaging the same. Learn how money you can expect to save by making this change! To download the case study, fill out the information boxes to the right and click Download The Case Study.